Directed by Nabuhiro Ymashita, Over the Fence is a contemporary Japanese drama based on the short story Ogon no Fuku by Yasushi Sato. The lead character Shiraiwa (played by Joe Odagiri), who is recently divorced, heads back to his hometown of Hakodate to enroll in a vocational school for carpentry. While living a rather mundane life there, Shiraiwa visits a local hostess bar with a classmate. 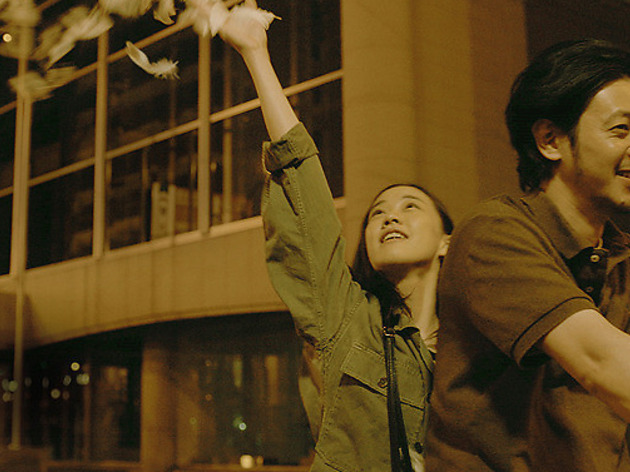 When he meets Satoshi, an eccentric hostess, his plain life finally begins to take color. Odagiri’s acting is best described as nonchalant. In portraying relaxed yet over-the-top characters, as seen in the role of gay man in Maison de Himiko and of a police officer in Late Night Restaurant, he seems comfortable enough to add original, subtle and dynamic tones to them. In Over the Fence, too, Odagiri nonchalantly shows off his indeed effortless style: without being completely immersed or trying his hardest to escape, the pained character confronts the audience (as if commenting: "Don't act surprised") while successfully veiling all of the misery, shame and self-pity inside. Aoi Yuu’s role as Satoshi is also eye-catching. Sweet and troubled at the same time, she beautifully portrays unique contradictions and naiveté in her role. As for director Nabuhiro Ymashita, who, in large part, has focused on comedy films in the past, Over the Fence will serve as an artistic turning point.